Feeders are a good way to attract birds. 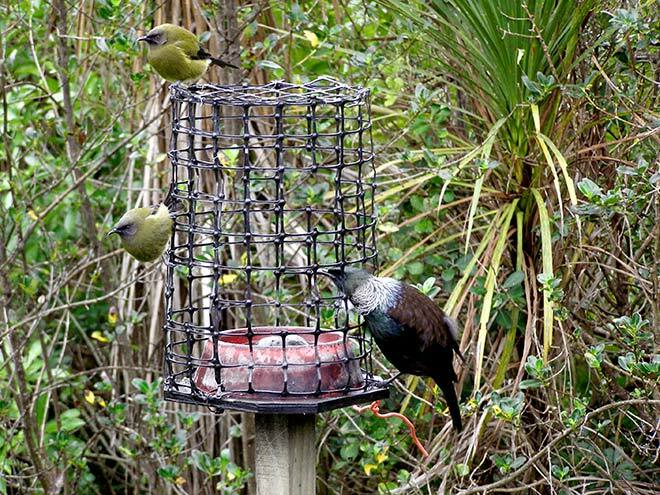 This one has sugar water for nectar-feeding birds such as stitchbirds or, as shown here, bellbirds (left) and tūī. The netting keeps out cats and other animals, and larger birds such as magpies. Birds up to the size of tūī can fit through the holes. There is usually a battle for dominance between the species – tūī bully the bellbirds, which in turn scare off stitchbirds.